Now these eggs are great to serve when you have friends over for brunch! They’re easy to make, super tasty and they’re pretty sassy! 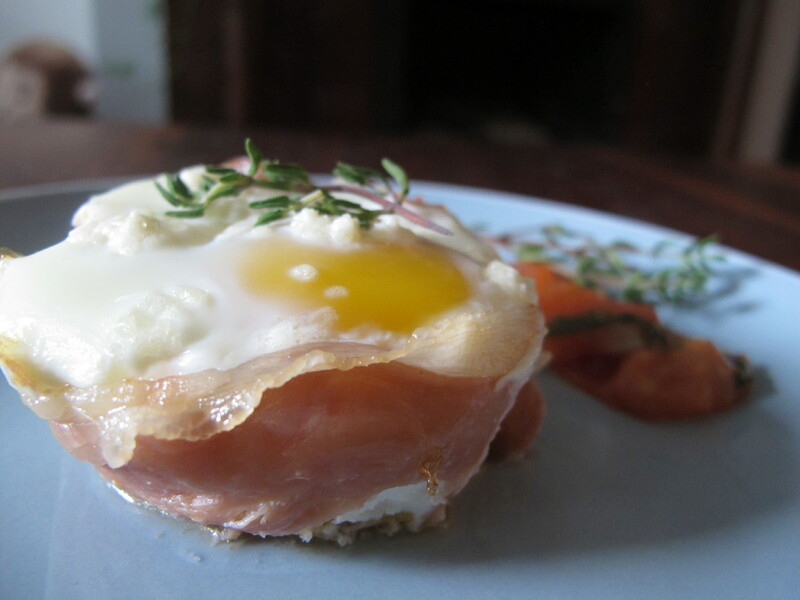 All you need are eggs, prosciutto, and a muffin tray. The rest is up to you! Heat your oven at 350F. Next, make your tomato sauce. In a pan, add some olive oil and garlic. Cook for 1 minute, make sure the garlic doesn’t burn. Add the tomatoes and the Thyme and cook for about 5 minutes until a sauce is formed. Put some tomato sauce in the bottom of each cup. Break an egg into each of the muffin cups. Do this carefully so that you don’t break the yoke. Sprinkle each egg with salt and pepper. Bake for 10-12 minutes until the eggs are set but still runny inside.You want the whites to be cooked. If they aren’t cooked to your liking, you can return them to the oven and check every minute. Serve immediately with a toasty baguette and some extra tomato sauce on the side! I still can’t beleive that I took this picture! How amazing is it! Put the olive oil in a pan and heat over medium heat. Drop the garlic clove into the oil and cook a few minutes to infuse the flavor into the oil, remove it as it comes to temperature . Fry the chickpeas for about 5 minutes. They will go from looking like cooked chickpeas to toasted nuts – golden, and crunchy. Add the red pepper and cook for a few minutes. Dice the cooked garlic clove and put into a bowl. 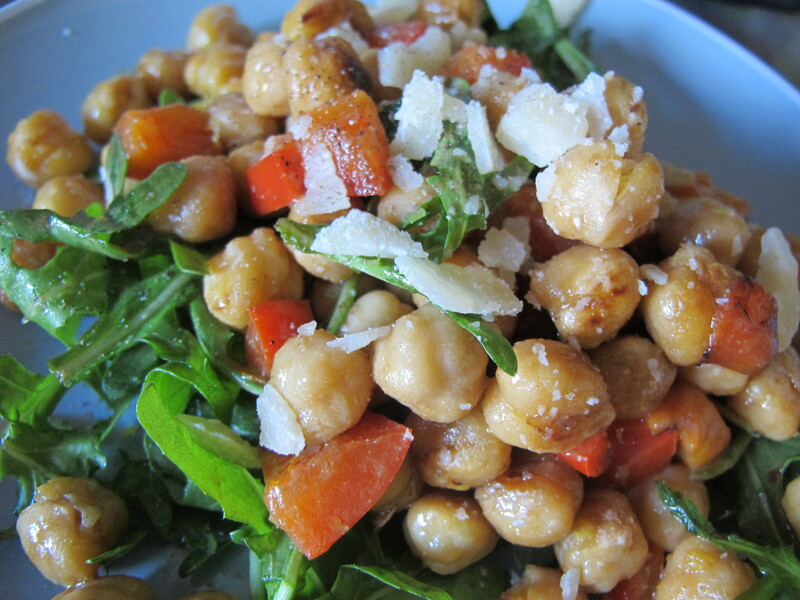 Add the chickpeas and pepper and toss with salt, dressing, aragula, lemon zest and grated parmesan cheese.